A normal flipbook with only text and images is supposed to be boring and unattractive, if the flipbook has possibility to contain audio and video on pages, that would be wonderful. The video contents do enrich the publication and make the book vivid. 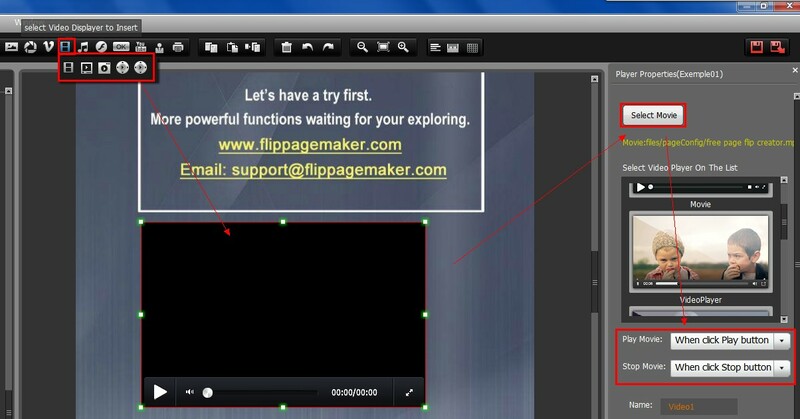 Now I have a flv video clip, how can I add it to the pages of flipbook with A-PDF FlipBook Maker? Note: To embed video clip on pages, the A-PDF FlipBook Maker Professional is required. Step 1 : Run FlipBook Creator Professional on PC and start new flip book project. Step 2 : In design interface, click Edit Pages to enter into the Page Editor interface where you can apply multimedia contents on pages. Step 3 : Click icon “Select Video Displayer to Insert” and choose a displayer, then draw a box by mouse on target page to insert the displayer. Step 4 : In properties panel, click “Select Movie” to select the flv video clip you want to insert, you can also add f4v and mp4 video. Then you can set how to play/stop video, also the size and position of displayer.